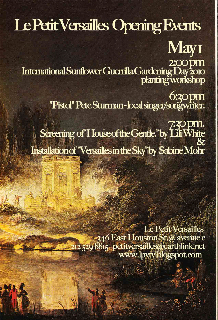 On May 1, guerrilla gardeners around the world sow sunflowers all over the place. It’s a way to bring beauty, bumble bees and bundles of fun to your neighborhood. - “Pistol” Pete Sturman – local singer/songwriter. - Ongoing screening of House of the Gentle by Lili White. House of The Gentle interprets eight hexagrams from the classic text oracle of the I Ching, or Chinese Book of Changes, thru gestural performances set in Nature, Chaco Canyon, and Shofuso, the Japanese House & Garden in Philadelphia. Lili White performs in Nature’s stage set; her form suggests a bodily connection to a dream logic—that is no logic—no answers posited to –?–— What was the question? “…Nature as a reflection of consciousness: eschewing traditional Western schemes of landscape as monumental & eternal…the East’s (view is) the notion of landscape as ephemeral form and infinite process, like Chinese landscapes (that) achieve a dynamism to suggest something numinous and wonderous beyond eternal form.” – taken from a museum comment card. The I Ching is a “reflection of the universe in miniature.” Its hexagrams represent descriptions of certain states or processes, using the essences found in Nature as the basis for its descriptions. There are a total of sixty-four different yet archetypal forms of energy described. The “gentle” refers to wood or the wind, both are gentle yet penetrating powers. - Installation of the luminous painting Versailles in the Sky by Sabine Mohr detailing an aerial view plan of the real Versailles of France.